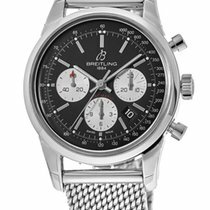 An excellent condition pre-owned stainless steel chronometer certified automatic movement gentlemans 43mm case size Breitling Transocean Chronograph (AB015212/BA99) featuring a black baton dial housing black sub-dials and a date aperture in-between 4 & 5 O'clock surrounded by a domed bezel. This particular watch is on a full retail length stainless steel ocean classic 'mesh' bracelet, it comes complete with its box and all relevant paperwork being originally UK supplied as new by ourselves on 30th April 2015. 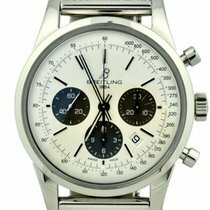 As part of the five year Breitling warranty this watch must go in to Breitling in year two & year four. 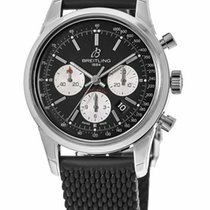 This watch has been back to Breitling's UK service centre for its two year check up, it will be due again in May 2019.